My primary research interest in particle physics is the dynamics of hadrons, in particular the role of glue in the strong interaction limit and of mesons "beyond the quark model", such as glueballs, hybrids and molecules. Most of my work, post-retirement, is in writing about physics. 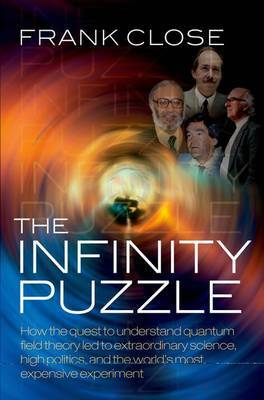 Infinity Puzzle (OUP 2011) My latest book, The Infinity Puzzle, comes out in November 2011. I am currently researching the life and work of Bruno Pontecorvo. IJR Aitchison, FE Close, A Gal et al. Gluonic charmonium resonances at BaBar and belle? THE D*0 ANTI-D0 THRESHOLD RESONANCE. T Barnes, FE Close, JJ Dudek et al. The end of the constituent quark model? Electroweak production of hybrid mesons in a flux-tube simulation of lattice QCD.